Meet our May Member On The Move, Brady Robbin! What do you do from 9 to 5? I work in market access/patient services at a large pharma company on the North Shore. In essence, I assist in making a connection between the physician, pharmacy and payer to enable the patient to receive their therapy. When do you make time to workout? I keep a pretty busy workout schedule. I can usually be found at the 5AM West Loop class, and then it’s likely running and/or yoga somewhere in the neighborhood nearly every evening. What inspired you to get into CTF? 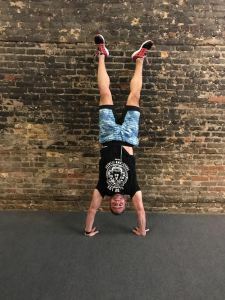 I went through a number of back surgeries (wear and tear from years in the Navy that resulted in six surgeries in about 12 years) and was ready to return to a healthy and active lifestyle. The personal training and class instruction were exactly what I needed to make that return and to do it safely. Fun fact #2: I’ve ran a half-marathon in nine consecutive months and have set a goal to run a half every month in 2017 – I’m also running the California International Marathon in December (can you say “Boston Qualifier”…).